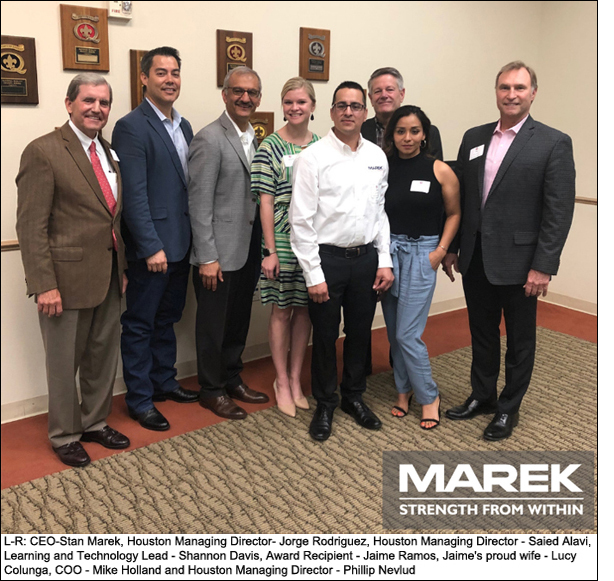 MAREK Field Supervisor Jaime Ramos was recognized Friday at AGC Houston’s Patrick J. Kiley Excellence in Leadership Awards Program as the 2018 AGC Standard of Excellence Award winner. Jaime, nominated by McCarthy Builders for his outstanding work on the Museum of Fine Arts Houston (MFAH) Glassell School project last year, shares this award with his crew and fellow award nominee MAREK Project Manager Jay Lee, shining a spotlight on the quality craftsmanship drywall, acoustical and other interior trade professionals and project managers deliver for the construction industry. Jaime joined MAREK in 2011 when a friend referred him to the training program. He had a few years of construction experience and was looking for an opportunity to grow and take care of his family. Supervisors quickly noticed Jaime’s outstanding attendance, willingness to help, desire to learn, and quiet determination. He worked well with everyone, took initiative to solve problems, and worked safely with a “no punch” attitude. Today Jaime is a MAREK Field Supervisor specializing in occupied hospital renovations and complex projects with unusual or detailed designs, including the many artistic design details within the MFAH Glassell School project. Helpers and Mechanics in Jaime’s Basic Construction Math and Basic Drawings/Layout courses agree, frequently commenting on how well he explains the material and is willing to take calls and answer questions after class. When Jaime took over as the math instructor, his supportive teaching style increased successful student completions by more than fifty percent. Throughout his career, Jaime has in turn worked to help others grow as well – first as an on-the-job coach and now as a field supervisor and instructor. He promotes construction careers by volunteering at school events including drywall clinics and speaker panels. Jaime is just as committed at home as he is at work. He and his wife, Lucy, met as teenagers, later fell in love and are now proud, devoted parents of three children. He and Lucy’s positive, can-do attitudes carried them through a difficult time two years ago when they lost everything to flooding during Hurricane Harvey. In the face of an overwhelming challenge, Jaime’s main concerns were the safety of his family at home and his family at work. He was back on the jobsite ensuring his crew had everything they needed and his students did not miss a class. In addition to the AGC Houston award, Jaime was recognized nationally last year at the Associated Builders and Contractors’ (ABC) convention in California as one of four national ABC Craft Professional of the Year finalists. The Associated General Contractors of America (AGC) Houston Chapter’s Standard of Excellence Award is presented annually in special recognition of a construction industry employee who most exemplifies the highest standards of excellence: teamwork and professionalism, creativity and innovation, commitment and cooperation, customer service and quality and community service.